﻿When I first found RealFruitJewelry online, I knew I had to try it. Anyone who knows me knows that I am crazy for fruit. I eat fruit at least 4 times a day and carry it everywhere I go. I have been known to take plums to the bar even (haha). RealFruitJewelry creates jewelry fruit real slices of fruit. I looked through all of her items in her Etsy shop and decided on the awesome strawberry necklace and orange earrings. I love them both. The slices of fruit are preserved and the coated in a durable clear, glossy resin that keeps the jewelry fresh looking. There are so many beautiful options. Next, I want the kiwi earrings! The items that I was sent are awesome. They are very durable which I was initially concerned about. They have gotten many compliments so far. This is the perfect shop for me! The items are affordable and beautiful. If you are looking for fun jewelry for the summer, this would be a great option. I highly recommend checking it out. 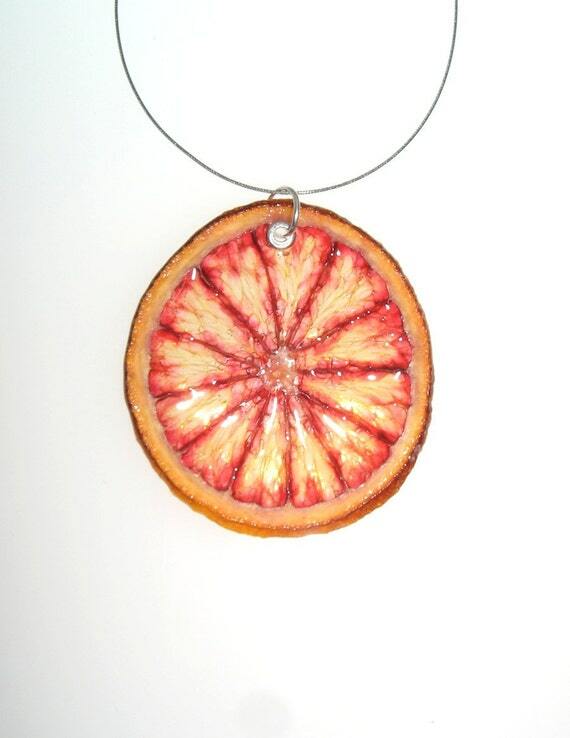 The giveaway will be for this beautiful blood orange necklace from RealFruitJewelry which is the most popular item.